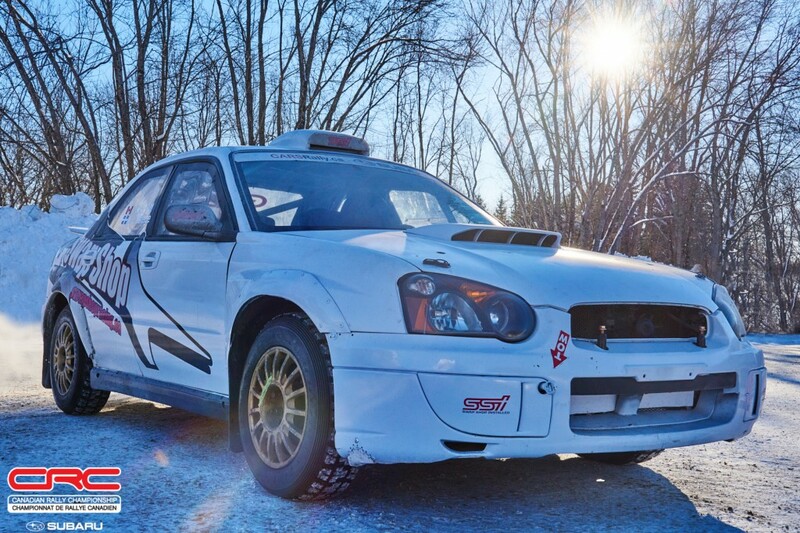 For Maxime Labrie, driving the former Subaru Rally Team Canada car is a dream come true. It’s the result of careful consideration, and the support of the whole Labrie family. It’s big news from a driver who has shown a lot of speed in the past but has also had setbacks. The new car was shipped to Swap Shop outside of Montreal to be setup for Labrie. They’ve worked full tilt since getting the car to set it up in a way that suits Maxime following a test session earlier in January. “It’s an amazing car for sure, but I will have to take some time to get used to what it can do,” said Labrie, who forecasts that Rallye Perce Neige will primarily be about learning the new car. From there, the team plan to tow west to the Rocky Mountain Rally, an event Labrie has never done. 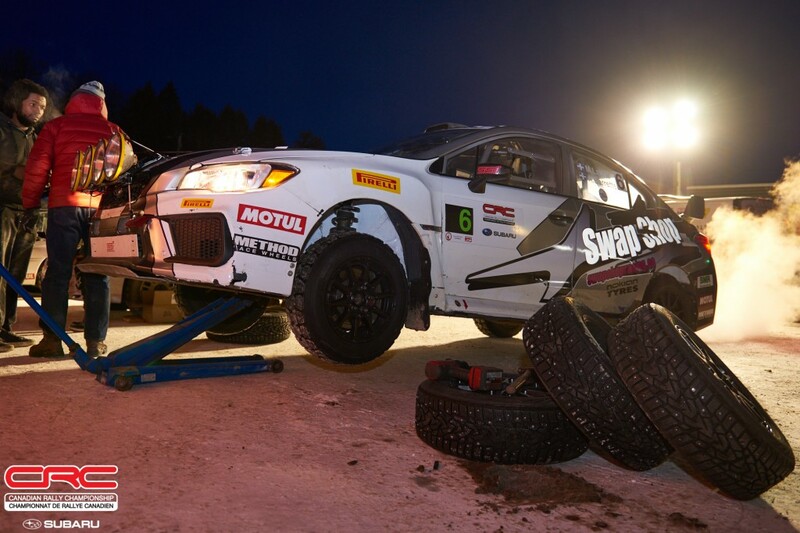 Again, the team will exercise caution to make the most of the event without creating undue risk, all while understanding how the car behaves on gravel. It’s with this plan that Maxime hopes he will be able to really start to attack at Rallye Baie des Chaleurs, an event he knows well, in a car he’ll know much better. Though the season is still flexible, Labrie plans to do at least two of the western events, as well as the Lincoln Electric Rally of the Tall Pines, and run every event in his home province of Quebec. 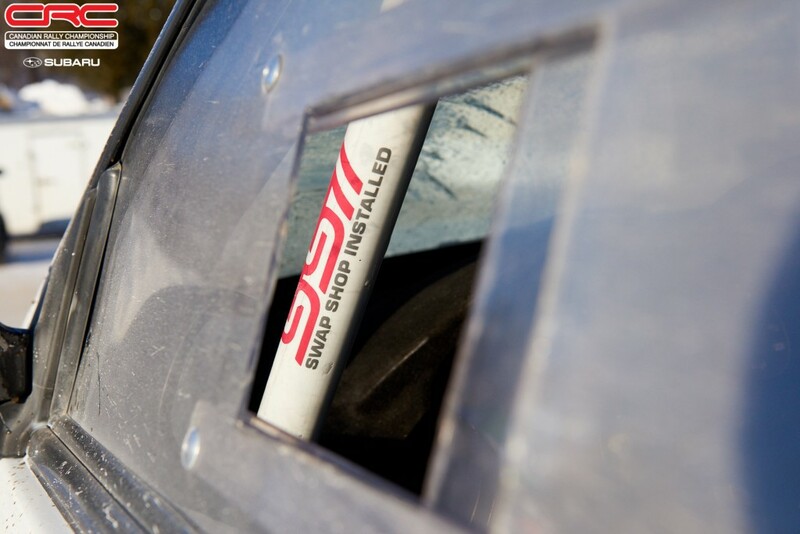 Long-time rally fans will also be keen to see Swap Shop back at the service park in a bigger way. “I was talking with my son about rallying,” said André Brunet, owner of Swap Shop. “During the conversation, I began to feel a real excitement to be back rallying. That’s translated into plenty of 18 hour work days, a few nights even sleeping at the shop, but the team feels they’re in a good position to start the year. Labrie’s new car is the product of that devotion, with many hours being spent learning the new car and being ready to ensure that whatever happens on the stages can be resolved back in service. At the same time, they’ve done almost an entire rebuild of Labrie’s old car and enticed Antoine L’Estage to return to Perce Neige to try out his fit with the team. It’s a bold move that is a reward for an exceptional amount of effort from everyone involved. L’Estage has been impressed with the work that’s been done. 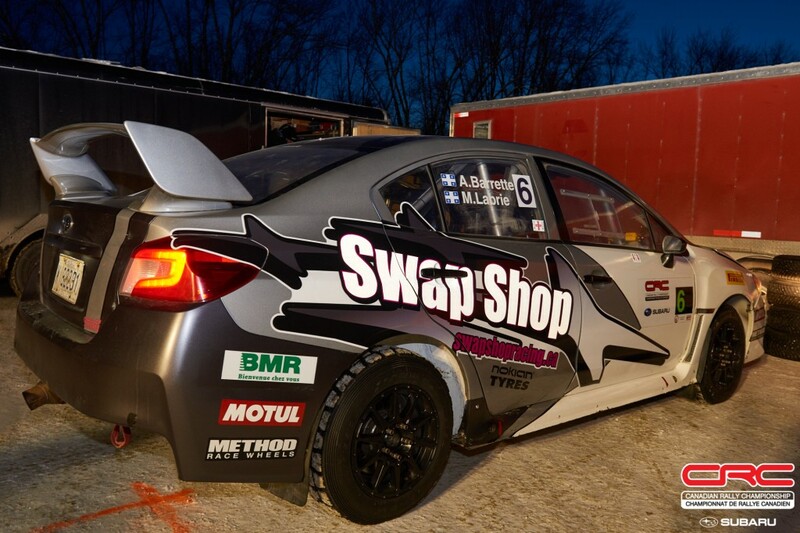 A January test day revealed a list of issues that needed to be addressed, and Swap shop flew into action to make sure the car would be ready for the 10-time Canadian champion. “The test went really well,” said L’Estage. “At the end of the day we all agreed that with a few changes we would be ready to enter Perce Neige. 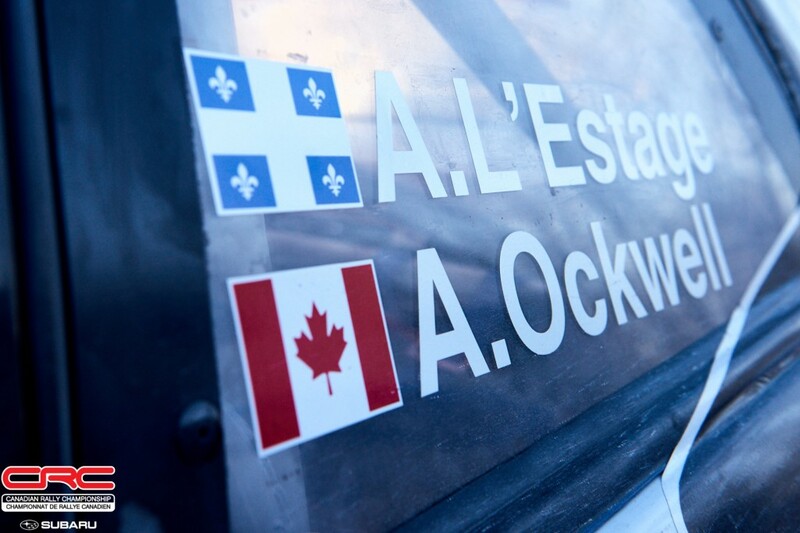 L’Estage will be joined by 5-time national champion co-driver Alan Ockwell, and despite being in an older spec car, expectations from fans may be high. “We’ll have a different sort of approach to this event, with less pressure to win,” said L’Estage. Still, the champion doesn’t come out hoping for anything less than the top step of the podium. There’s no shortage of other drivers likely to mix things up at the season opener. Crazy Leo Urlichich rolled at the event last year and still managed a second-place result. Meanwhile, Jean-Sebastien Besner and Yvan Joyal will aim to land on the podium, a position they’ve held at many national rallies in recent years. Sylvain Erickson will be looking to see if his custom-built Hyundai Accent will be free from mechanical problems. The Leblanc brothers from New Richmond, Quebec have shown excellent pace on the wintry roads at Perce Neige in the past. Marc Bourassa will also be one to watch especially as the night stages take prisoners out of the hunt for victory. Nicolas Laverdiere and Vincent Trudel are back having made the move to Open Class. All of these teams could have a shot at the podium, and illustrates one of the reasons Rallye Perce Neige is so compelling. The two wheel drive competition has some heavy hitters as well. Philippe Benoit and Ian Guité recently won a regional event in their Mini Cooper S, but they’ll have to hold off Chris Greenhouse and co-driver Ryan Dunham. Mal Swann and Martin Cadieux are likely to show potential in a Golf. For Labrie, like perhaps much of the field, the event will be an opportunity to see just how close he can get to the pace of the champion. Follow the action from Rallye Perce Neige through the CRC Facebook and Instagram accounts.